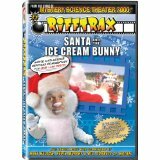 The RiffTrax gang makes the already humorous bad film “Santa And The Ice Cream Bunny” even more amusing. For those RiffTrax fans that didn’t want to purchase the on demand release of “Santa And The Ice Cream Bunny” late in 2010, you will be happy to know that DVD release is now available. ‘Santa’ is a truly a wretched affair involving a stranded Santa telling a story within a story about a young girl watching a “Thumberlina” exhibit while imagining herself in the story. Once the story finally ends (it goes on for a long time), Santa winds up being resuced by the Ice Ceam Bunny and that’s the entire movie in a nutshell. What “Thumbelina” (or the Ice Cream Bunny) has to do with Christmas is anyone’s guess, but very little of this film makes any sense to begin with. Thankfully, the RiffTrax gang makes the film bearable by making jokes about the film’s dreadful pacing, the mole characters, a pinata bird, Santa’s dirty pants (don’t ask), and, of course, the freaky Ice Cream Bunny. As an added bonus to fans, a new short film has been included on this DVD which was not included with the on demand release. The 8 ½ minute X-Mas themed short is titled “Santa Claus: Punch And Judy.” Basically, it’s a pointless little short about Santa giving presents to children (namely a Punch and Judy puppet show). There’s some good jokes here by Mike, Kevin, and Bill about the wooden acting, the violent puppets, “Call Of Duty,” and Josh Groban. As for the video and audio quality, I’m afraid to say it’s rather poor. The video quality looks like a 10th generation VHS tape and the audio can be hard to hear due to mumbling characters. At least the riffs sound loud and clear which is what matters most. Note: Viewers have the option of playing “Santa And The Ice Cream Bunny” with ot without the RiffTrax commentary.